Whatever game is your passion, Bodog takes you front and center with their sportsbook. From NFL to the madness of NCAA college basketball and everything in between – no really, they have horse racing and esports – Bodog is the one-stop source for sports enthusiasts. Besides earning top ratings from bettors, Bodog has earned rave reviews from sites geared to reviewing sportsbooks. The Bodog sportsbook doesn’t simply offer up lines, futures and props – it also provides a wealth of information for bettors, including free statistical analysis within its matchup and preview sections. You’ll also find live betting which lets you wager on every play in football, baseball and basketball. 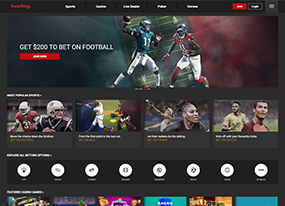 The sports offered at Bodog are MLB, NFL, NBA, NHL, badminton, boxing, cricket, UFC/MMA, horse racing, handball, NCAA college sports, esports, golf, darts, rugby, tennis, car racing (Formula 1, IndyCar) and Soccer (EPL, UEFA, MLS, La Liga, Italy Serie A, Ligue 1, FIFA etc.). You can also make wagers on entertainment like awards shows (Who will win the Emmy for Outstanding Lead Actor in a Comedy Series?) and Game of Thrones (Who will rule Westeros? Probably whoever isn’t dead by the end of the season.). At Bodog, you can bet on sports events in real time via their live betting interface. The odds are dynamic and change constantly based on the game plan and the bets being placed by the masses. You can bet on every play, every at-bat and every possession. For example, in MLB you can wager on the next batter getting a hit, striking out or taking a walk. In the NFL, you can bet on whether the next play will be a complete or incomplete pass, a run or a turnover. If it’s the 1978 San Francisco 49ers, it’s safe to bet on a turnover. Although, you’d have to go back in time to place that bet. If you do have a time machine, will you lend it to us? Someone on the OddsShark staff would like to go back in time and return her Aaron Brooks jersey. Bodog Sports Canada is a highly respected, customer-friendly operation that offers quality customer service. With a live chat option, you can contact Bodog’s customer service department 24-7. Their staff must adhere to a strict policy that demands email inquiries are replied to in 15 minutes or less, and that telephone calls are answered on the first ring. This sportsbook offers a Bodog bonus code on first deposits. In terms of a welcome offer, you get a Bodog bonus code that is easily redeemable, making it a breeze to get 100 percent on your first deposit of up to $200. There’s also a Bitcoin Sports Welcome Bonus of 100 percent up to $300 on your first Bitcoin deposit. Additionally, you can collect up to $100 for every friend you refer to Bodog Sports Canada. They also offer a multi-level loyalty program that allows you to rack up points for cashback bonuses. Bitcoin, credit cards (Visa, MasterCard), and Interac e-transfer are the deposit options at Bodog. You’ll notice that when you try to make bets in the thousands of dollars, you won’t be able to. Bodog has betting limits, which is fine if you’re not Charles Barkley and only look to make smart bets for fun. If you’re a novice bettor, then you’ll benefit from the limits set by this sportsbook. Even if you’re a seasoned wagerer, you’ll still be able to turn a small profit on your winnings. For NFL and NCAA football, bets are capped at $2,000. NBA is set at $1,000 with NCAA basketball at $500. Moneyline (straight up) bets for NHL and MLB cannot exceed $1,000. Unfortunately, Bodog is only available to Canadians and players from Latin America. However, their sister site Bovada does cater to players from the U.K. and the United States. The languages offered by Bodog Sports Canada are English, Portuguese and Spanish. Is Bodog the Right Sportsbook for Me? As a trusted sportsbook in the industry, Bodog is as good as they come. From their impeccable customer service to their mobile compatibility (Android, Apple), you won’t find a better sportsbook for Canadians and players from Latin America. With lines on all major sports like the NFL, NFL and NBA, props and futures, parlays, teasers and even live in-play betting, Bodog is a premier and trustworthy sportsbook that deserves five out of five stars.